Rollerball had the daunting task of overcoming extremely negative advance publicity, sometimes which can turn into a self-fulfilling prophecy. One potential benefit is that the movie, a remake of the cult classic from 1975, will have nowhere to go but up, since expectations are considerably lower. Well, amazingly, this film meets all of its expectations. Rollerball is nearly a complete disaster. Neither the plot nor the game makes much sense, and the whole thing is more an unintentional comedy than an action movie. 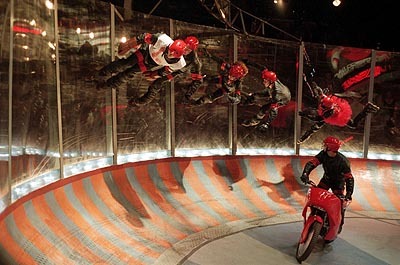 The game itself consists of two teams on inline skates on a figure eight course. The goal is to gain possession of the ball and make two laps, before skating up a ramp and throwing the ball at a target to score. The movie even proclaims that the other rules don't matter, so the people on motorcycles and other people with assorted weapons and masks never makes any sense. What also doesn't make sense is team owner Alexi Petrovich's (Jean Reno, Just Visiting, The Crimson Rivers) desire to obtain a cable deal in North America. Rollerball takes place somewhere in an ex-Soviet republic, and is supposedly internationally famous. It's obvious to tell because of the dearth of international announcers (including one in English) and an instantaneous global ratings system. So theoretically, a cable deal shouldn't be hard, since there are already fans in the United States, but who knows, maybe this is like soccer or cricket. 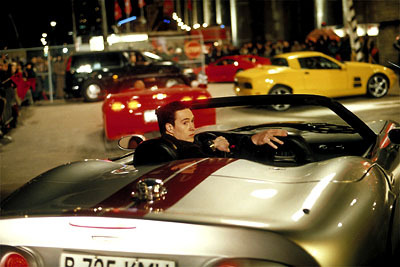 Jonathan Cross (Chris Klein, American Pie 2, Say It Isn't So) finds himself pulled into this glamorous, dangerous world by his friend Marcus Ridley (LL Cool J, Kingdom Come, Charlie's Angels). Cross joins for the money, but the fame eventually draws him in further, propelling him and Ridley to the top in terms of popularity. It also helps that Cross looks really cute and can play with ample dexterity. He also attracts the notice of Aurora (Rebecca Romijn-Stamos, X-Men, Austin Powers 2). Everything is peachy-keen for them until one of their teammates dies. A little investigation points toward sabotage, and Cross immediately tells Petrovich. Since this film is amazingly transparent, and since Reno overacts in every scene and has a nasty Eastern European accent, all signs point towards him as the bad guy. If it were anybody else, then this story would have something original in it. Larry Ferguson (Maximum Risk, Gunfighter's Moon) and John Pogue's (The Skulls, U.S. Marshals) of William Harrison's original screenplay is not adroit in any fashion. It moves events from the future to the present. The problem with this is that instead of making things look potentially futuristic, the game itself looks remarkably lame, like a combination of roller derby and professional wrestling. As Cross, Ridley, and Aurora become more wary, more accidents occur, which eventually prompts Cross to try to leave the league. Of course, Petrovich will not let this happen. But before it might, the script throws in some random thoughts on the plight of the working class in Eastern Europe and their oppression by greedy capitalists. Just as soon as Petrovich mentions it, the story forgets about it. It's possible that the main point that director John McTiernan (The Thomas Crown Affair, The 13th Warrior) is trying to make is that ratings are slaves to greed. Miraculously, Petrovich can obtain instant ratings. He notices that when there is more violence, the ratings immediately go up. How are more people suddenly watching? Nobody knows. But this begins a vicious cycle for Petrovich, who ups the blood and gore whenever things look like they might turn dull. McTiernan, who is extremely capable of filming intense action sequences, drops the ball here. He frequently favors the use of choppy editing which is more frustrating than anything else. Rollerball turns away from the sport and into a chase movie, with one extended sequence filmed in green night vision. Why? Nobody is wearing night vision goggles, so it is just another mystery. The rollerball games are exciting, but the fact that they are incomprehensible hinders their effectiveness. Wooden acting by all three leads also helps to sink the film. As an action star, LL Cool J does have charisma, and he's terribly funny in some roles. He really has nothing to do here except make a couple comments here and there. Romijn-Stamos walks around half naked (but always in shadows!) with a bad fake accent. Klein carries the movie, and he is much too passive to be of any use. It's an interesting contrast to his character, who is aggressive while on court. Off court, he seems lost and confused. Cross is also remarkably naive and trusting, and this begins to become intensely annoying. Some movies are bad enough that it is fun to make fun of it, but Rollerball sinks even lower than that. 1 hour, 39 minutes, Rated PG-13 for violence, extreme sports action, sensuality, language, and some drug references.